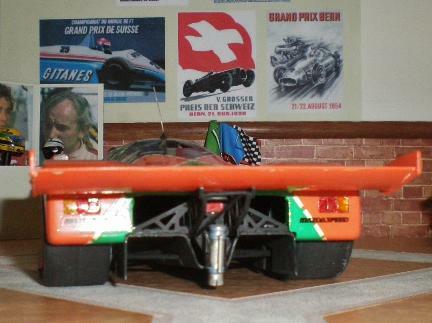 The Mazda 787B was designed for Group C sports prototype racing in the World Sportscar Championship, All Japan Sports Prototype Championship, the 24 Hours of Le Mans and IMSA GTP regulations. 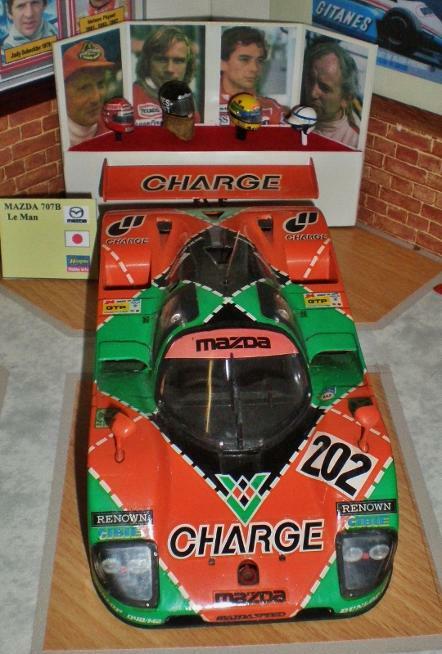 Powered by Mazda's R26B Wankel rotary engine the car lacked the overall pace of Mercedes-Benz, Jaguar, and Porsche, as well as Nissan and Toyota in the Japanese Championship; but were reliable and that allowed them to contend for their respective championships. 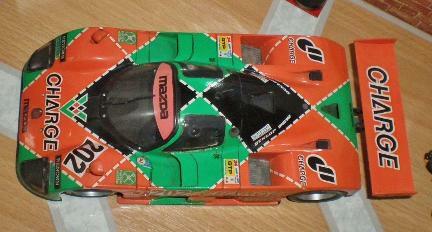 Because of its similar dayglow orange and green livery the 767B is often mistaken for the 1991 Le Mans winning 787B. 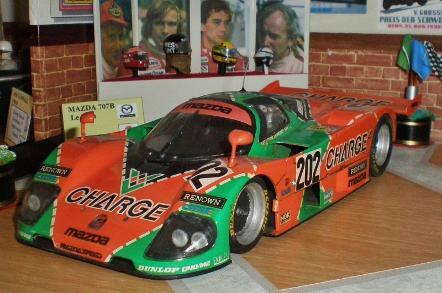 Our model is 767B #202 chassis nr.002 sponsored by 'Charge' which finished 2nd in class and 9th overall in the 1989 Le Mans 24hrs race. 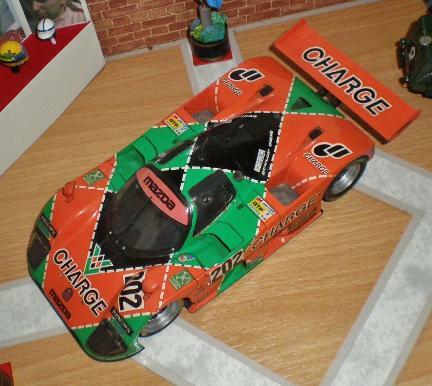 Hasegawa released their 1/24th scale “Charge” Mazda 767B, kit # CC-018 around 1990 and followed it up with the “Finish Line” version of the Mazda 767B, kit # CC-20 soon after. 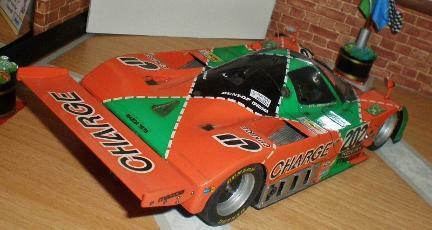 This is basically a decal conversion as the plastic is the same, likewise for the “NWB” Mazda 767B, Hasegawa kit # 51560, released some time later than the original versions. Small differences taken care of by additional sprues. The decals for each of these have been released by Shunko so you can change the version if you only have the slightly more easily available “charge” version. 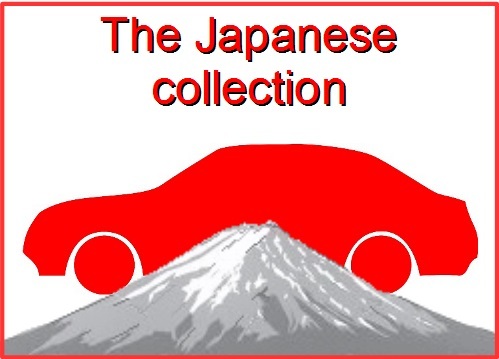 Studio 27 have released three decal conversion sets so there is scope for building other racers of interest. 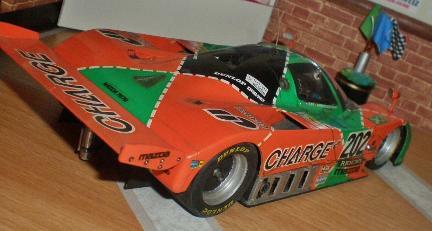 Built in the early 1990s this is one of Ian's earliest race car models. 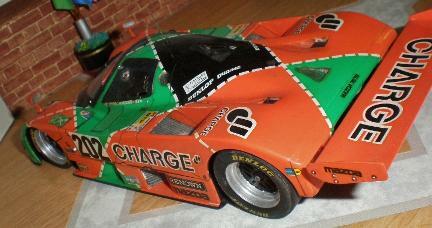 It is built straight from the box and painted with Humbrol enamels. Hasegawa's kit is very straight forward to build and detailed enough for a curbside kit.